This picture stirs the imagination. 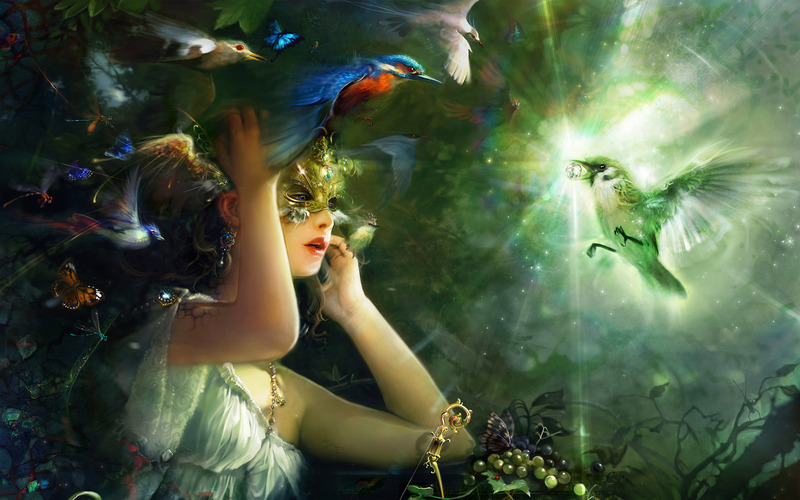 Birds, butterflies, a fairy princess, and a gift of power…. That’s not good. I’ll look into that. The picture doesn’t show up on my computer. I love these! They absolutely make me start to dream and begin to imagine their stories. She is a princess who has lived in deep in the forest since she was kidnapped as a toddler. She learned the ways of the animals and identified most with the birds. She learned their songs and what they meant and though they come from her in the form that sounds more like a song, they can communicate with understanding. The birds have cared for her and provided her with food and clothing and surrounded and protected her. Tonight birds of every species have come to surround her and join in the great celebration. Tonight her true identity will be revealed. As she receives the royal ring, she will suddenly become aware of who she really is. Tonight she will no longer be confused by trying to find her identity in other species or other systems. Tonight her heart will come to rest as she looks inside and see the princess she has been all along.